Delighted and privileged to call his occupation “musician,” John is proficient in classical, jazz, and commercial settings. A native of Wilmette, IL, John is an active performer and educator in the Northwest Indiana and Chicagoland regions. He has performed with the Owensboro Symphony, Evansville Philharmonic, Orchestra Kentucky, Columbus (IN) Philharmonic, Bryan Symphony Orchestra, and the Tennessee Philharmonic. John has performed in touring Broadway productions of Disney’s Mary Poppins and Legally Blonde: the Musical. He performed numerous musicals as trombonist for the Cumberland County Playhouse including: Ain’t Misbehavin’, Guys and Dolls, The Music Man, Big River, and White Christmas, to name just a few. He can be heard on the critically acclaimed debut release from the Dave Lisik Orchestra, Coming Through Slaughter: The Bolden Legend, featuring Tim Hagans. An avid chamber music enthusiast, John has presented concerts and masterclasses throughout the United States with Bay Street Brassworks, Mirari Brass Quintet, Hoosier Brass Quintet, and of course, TROMBOTEAM! As a jazz trombonist, he was a member of the Groove Merchants of Tennessee and has appeared with many big bands including David Baker’s Jazz Ensemble at Indiana University. John has presented masterclasses at Potsdam Conservatory of Music, Converse College, University of Louisiana-Monroe, Valparaiso University, Youngstown College and numerous public school classrooms. He has also performed as a guest artist at Cornell University, University of Southern Mississippi, Cederville College, and Merit School of Music. John was a semifinalist for the 2008 Eastern Trombone Workshop Solo Competition. 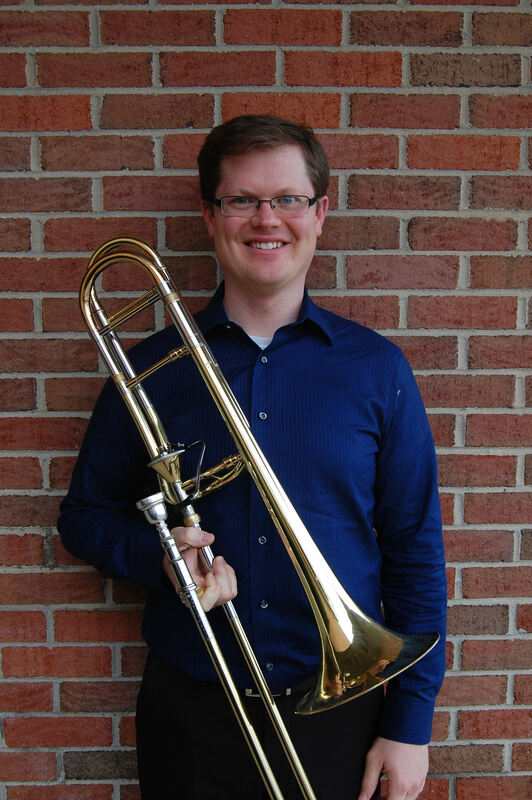 He earned a Master of Music degree in trombone performance from the Indiana University Jacobs School of Music where he served as Graduate Assistant for the Trombone Area and was webmaster for Prof. M Dee Stewart. John holds a bachelor’s degree from Tennessee Technological University and credits Peter Ellefson, Susan K. Smith, Joshua Hauser, and Tim Coffman as his private instructors. John resides in Valparaiso, IN, with his lovely wife, Ericka, also a professional musician. In his free time, He is a fan of sports, movies, and cooking (although not as much as the eating).